Colloqate's vision of an inclusive space along New Orleans' Claiborne corridor. Courtesy Colloqate. In the years since the Great Recession cratered the steel and glass fantasies of a generation of architects, architecture centered around social justice has gained salience and ever-loftier pedestals. But while architects speak of aspirational ways that design can inspire people to be better, more empathetic citizens, design often does the exact opposite: oppress and marginalize. Often applied to communities that are already marginalized, the design of space communicates power dynamics and value systems. 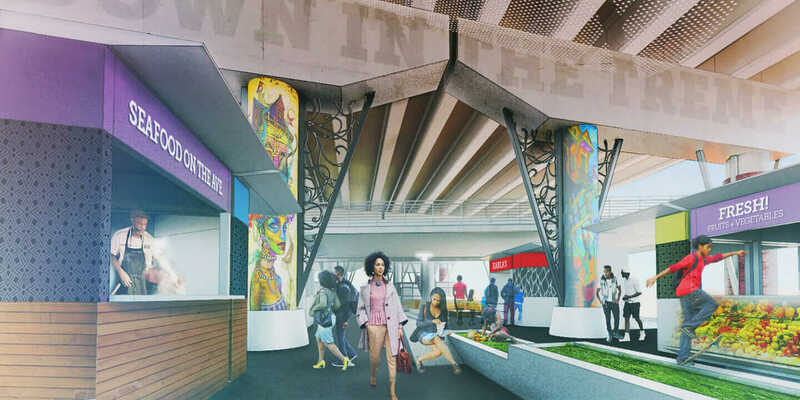 A blank concrete wall, transit that’s out of reach, a skywalk system that disengages the business class from the messy city below—each has a purpose that incorporates design as an accomplice. Bryan Lee of New Orleans–based Colloqate Design has dedicated his career to decoding these hidden signals and promoting design as a tool for social justice. Colloqate’s mission is to “organize, advocate, and design for racial, social, and cultural equity,” says Lee, whose work focuses on facilitating public discussions on the value of ambiguous public space with an eye toward repairing past wrongs. Fernando Romero’s ‘Border City’ concept straddles the US-Mexico border in place of a wall. Courtesy Colloqate. Examples of oppressive design aren’t limited to a type of building. “Any typology can perpetuate injustice,” he says. “It’s just a matter of how it’s placed in the world.” Instead, Lee points to broader systems and narrower building features. Diagnosing them, he says, is a vital step to formally incorporating social justice concerns into architects’ code of ethics and formulating a Hippocratic oath for designers. These four examples of ways design can reinforce or contribute to oppression, then, are the equivalent of a CDC warning: Design and inhabit at your own risk. Circulation patterns that disconnect from surrounding urbanism meant to “isolate a certain set of people within a boundary” have marginalized communities, says Lee. It’s an issue often spotted in large public housing developments from the early-to-mid 20th century. At places like Chicago’s infamous Cabrini–Green or San Francisco’s Potrero Hill, the street grid is interrupted with dead ends, or meandering lanes. This creates blocks that turn inward, disconnected from the surrounding city. The areas—and the people who live in them—become less and less known to their neighbors and easier to forget or stigmatize. It’s one way into a cycle of disinvestment that often renders these places uninhabitable. The issues behind cities building these neighborhoods, Lee says, are rooted in paternalism and lingering institutional racism; and sometimes assumptions about a how a stigmatized group (namely poor people, often African-Americans) would prefer to live. The designers of the Lathrop Homes in Chicago, for example, turned that development inward in order to build a sense of working-class solidarity and refuge from the wicked city beyond. Wide categories of design, such as circulation and the way large developments connect to their context, are important enough to be redefined in architects’ code of ethics, Lee says. It should be a professional imperative to ensure equitable access within and outside of one’s neighborhood. 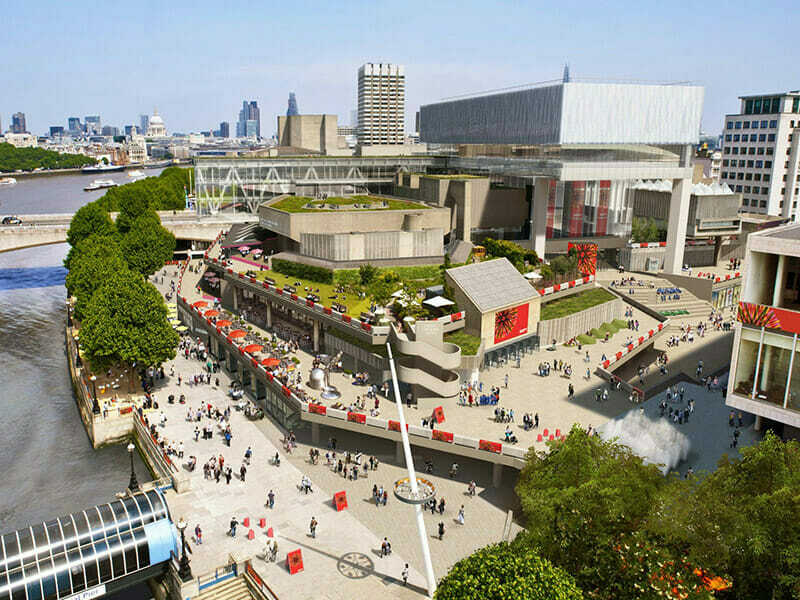 An early plan to expand London’s Southbank Centre envisioned many mixed-use public spaces. Courtesy Leslie Martin. As an urban-scaled, and speculative, example of this idea, Lee points to Mexican architect Fernando Romero’s dense and interconnected Border City concept. With its networks of dual-nation transit and commerce, the proposed city, which would straddle the US-Mexico border in place of a wall, scrambles just about all traditional ideas of what a border is. “It is a bi-national space that ultimately seeks to humanize the migration process by intentionally creating an urban environment of access and permeability,” Lee says. Circulation patterns aren’t the only way designers sever places from the vitality that surrounds them. Large, undifferentiated facades that lack transparency become “dead spots,” Lee says. It’s a subtle variation in the environment that works nearly subconsciously; spaces are faceless, unaccountable, and devoid of human scale. Investments that are economically out of scale with their neighborhoods foster gentrification and displacement. An example is a large residential development that includes subsidized housing—which is thus pitched in terms of its mixed-income inclusiveness—placed on a former public housing site. In many situations, most new housing in these developments is offered at market rate, so instead of offering poor residents an opportunity to stay, projects hasten their communities’ dismantling, as services catering to affluent newcomers flood in and push others out. To avoid displacing communities with torrents of capital, architects (and their clients) need to expand their scope of services to include pre-design exercises that accurately and critically assess how development will affect those who are most vulnerable, Lee says. These questions can only be effectively addressed at the beginning of the design and construction process, and should be among the first things a designer introduces. 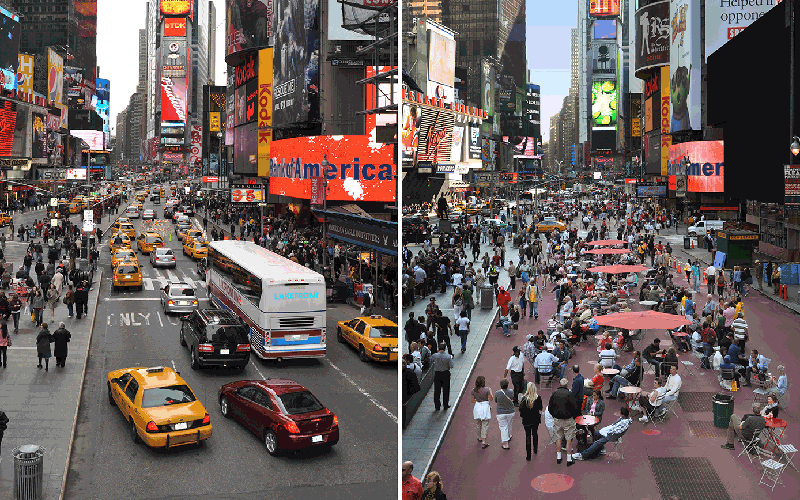 Reclaimed pedestrian space in Times Square, designed by Gehl Architects. Courtesy Gehl. Designers most often talk about design for security through a lens of inclusion—Jane Jacobs’ vaunted “eyes on the street” and other communal ways to share responsibility across urbanism. But just as common, though seldom acknowledged, are design features that promise security through punitive exclusion. These include loud music, bright lights, benches designed to be uncomfortable to lay on, and noise emitters that are generally audible only to young people; all ways to ward away “undesirables” such as the homeless or youth. Using these tactics begs a fundamental question: Who is the public realm for, if not the entire public? Catering to an approved constituency in public spaces is an attempt to “wash away community activation points,” Lee says. To elevate conversations with clients away from such exclusionary tactics, he suggests a shift in perspective. “What I tend to do is set people up in their own experiences of space as users, not as clients,” he says. Because clients creating the public spaces aren’t always a consistent presence in the places they’re commissioning, their perceptions of their audience don’t always match with reality, Lee says. “[It’s] convening your client to be a partner in this process toward the end user, rather than designing with the client as a one-on-one thing,” he says. It’s incumbent on the designer to bring the voice of community end users to the table—a strategy that’s a good place to start, in the effort to turn design toward the service of inclusion and equality.